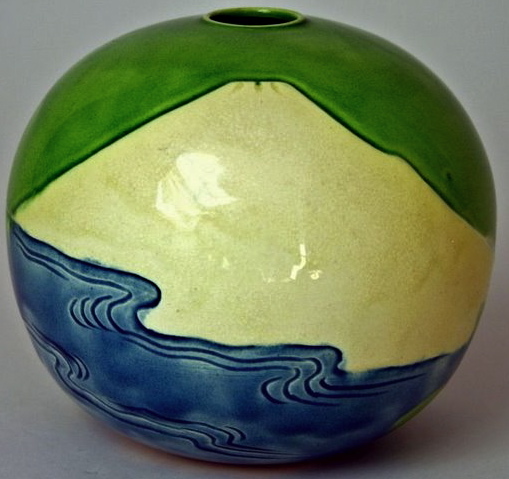 Awaji pottery was made on the Japanese island of the same name between 1830 and 1939. Most of the pieces that we see here in the West were made sometime between the mid 1870's when Awaji began exporting pottery, and the mid to late 1930's when the last of the kilns closed. Awaji pottery comes in an abundant variety of shapes, colors, and decorative techniques. The glazes are often brilliant in tone and most are translucent and finely crackled. 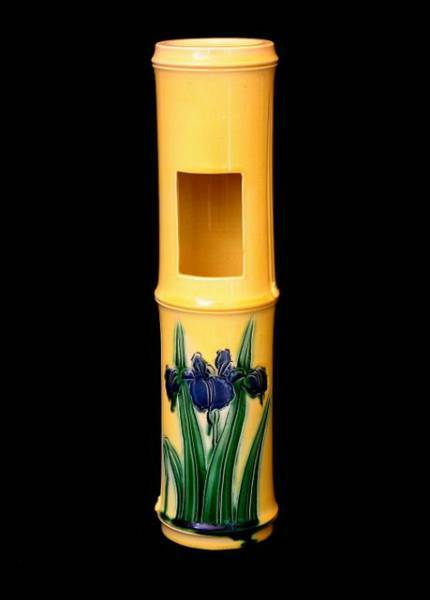 The ware is sometimes mistaken by the uninitiated for European majolica or American art pottery. Unlike majolica and the vast majority of Western art pottery, most Awaji pottery is robustly hand-thrown, with only small and complex forms molded. Some of the earlier ware is delicately potted, but the majority of Awaji-ware is more stoutly constructed and pleasantly balanced. The Awaji potters were masters of their craft who had an innate feel for the possibilities of the clay form. The result of their efforts is a pottery of exceptionally lively forms that have an informal and genuine feel, devoid of fussiness and pretension. The ceramic body (or paste) is made of high-fired, white or cream colored clay that borders on stoneware. The formula apparently changed over time and varied from pink or buff, to white to grey. The glazes are lead based which gives the colors brilliance and makes the translucent enamels glassy and often iridescent. The most common Awaji glaze colors are a grass green, yellow that can range from pale lemon to deep amber, cobalt blue, and aubergine. 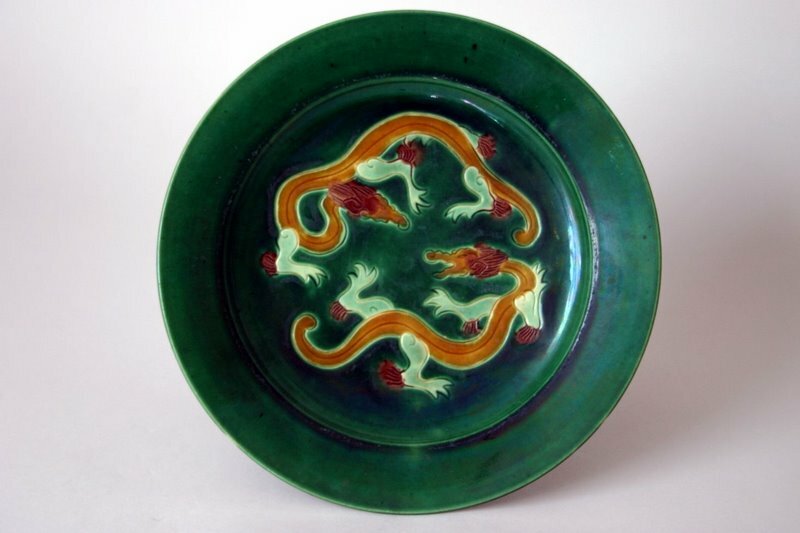 Other glazes are a light green, dusty blue, light and dark turquoise, mirror-black, and burgundy. The Awaji potters were adept at creating unadorned monochromes, two-tone glazes, three-color glazes (sancai), incised decoration (most commonly featuring irises), and applied relief decoration. Awaji is an island in Japan’s inland sea between Honshu, the largest of Japan’s four main islands, and Shikoku, which is the smallest. The island is known for its beautiful scenery and quaint fishing villages which have attracted artists seeking retreat and inspiration for centuries. There is a renowned puppet theatre, ningyō jōruri, which performs traditional dramas on the island which has traveled internationally. The narrow channel between Awaji and Shikoku is the site of the dramatic Naruto whirlpools featured in Japanese legend, which are caused by the tidal flow in and out of the inland sea. Awaji is now connected to Honshu by the Kobe-Awaji Bridge, which is the longest suspension bridge in the world. The first kiln on Awaji was started in 1831 by a doctor named Minpei in the village of Iga. Minpei was an energetic man of some means with wide ranging interests. He is known to have been a doctor, a talented writer, a renowned chajin (tea ceremony master), a soy sauce factory owner, and run a large fishing cooperative before devoting all of his energies to ceramic manufacture. In 1834, Ogata Shuhei, a highly esteemed Kyoto potter, came to work with Minpei for two years. A wide variety of fine wares were made in the fifty years which followed. The kiln was known for fine Satsuma-type pieces in the Kyoto or Awata style with elaborately glazed geometric designs and aptly executed foliage and wildlife. Minpei also mastered underglaze-blue decoration, carved celadons, ceramics that cleverly imitated bronze vessels, and bright yellow and green monochromes with incised designs. In 1842, the provincial Daimyo, or Governor, came to visit the operation and granted Minpei an official kiln status. Minpei retired in 1862, leaving the kiln to his son Rikita and nephew Sanpei. By the 1870's, Rikita and Sanpei were each running kilns of their own and exhibiting in the International Exhibitions, where their wares were well received. In the late 1870's, Christopher Dresser, the influential British designer, visited the two kilns and ordered examples of each to be shipped back to England for study. In 1883, Rikita sold his works to a group that called the kiln Danto—which means “Group” in Japanese. Though Sanpei did not begin production at his own kiln until about 1870, his operation quickly became the larger of the two. A third kiln was set up in Awaji's capital, Sumoto, in 1883 by Tamura Kyuhei. Some of the artists in Awaji evidently maintained a relationship with their counterparts in Kyoto. Pieces from each region continued to share similar raw materials and processes as well as nearly identical forms, glazes, and decorative techniques. They each used cream colored pottery clay with brilliant enamel glazes, fired to approximately the same temperature. Each used the point bottle form and the popular squared buttress handle form. Through the 1880's and 90's, the Danto and Sanpei kilns, evidently influenced by their clients in the West, began to shift their styles. As the export market developed Awaji pottery evolved from a distinctive regional style intended for domestic consumption to a pottery influenced by international tastes and markets. Despite this influence from outside pressures, the Awaji pottery retained its unique regional flavor. The forms became simpler and more organic; the decoration parsed to a spare and bold, but still spontaneously confident manner. Bright green, yellow, and blue glaze grounds were used both as monochromes to show off the forms, or as grounds under carved, incised and applied decorations highlighted with other blending and contrasting colors. The Awaji potters were obviously aware of the International art movements of the late 19th and early 20th centuries. In response to the Art Nouveau style they used sensuous, organic, forms with sweeping curves and handles. 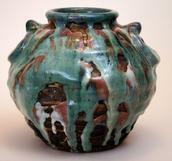 These forms were accented by two tone glazes which melted into one another with hypnotic effect. These forms gave way to the boldly geometric style of the Art Deco movement. These are characterized by architecturally squared buttress handles and feet, along with rocket and other space-age forms. The Deco then gave way to the Modern Movement. The pieces made during this last long movement are some of the most interesting of the Awaji output. During this final period (1922 - 1939), Sanpei's kiln produced an impressive array of extremely creative art pottery. A number of new glazes were developed, many of which are now used in striking flambé mixes. The two kilns closed in 1939 as the export market dropped off preceding World War II. Dating particular specimens of Awaji pottery, especially the earlier ware, can be challenging. The vast majority of pieces here in the West were probably intended for export beginning about 1875. Some pieces, based on style, could be earlier, but it is difficult to be certain. It is also unclear when the Danto chidori and the Sanpei flag mark were first put into use. The chidori is seen on pieces that may predate the kiln's change in ownership in 1883. It is possible that the flag mark was being used sporadically by the 1880's. Export marks provide some guidance with dating. U.S. tariff law required that the country of origin be written on exported goods starting in 1890. 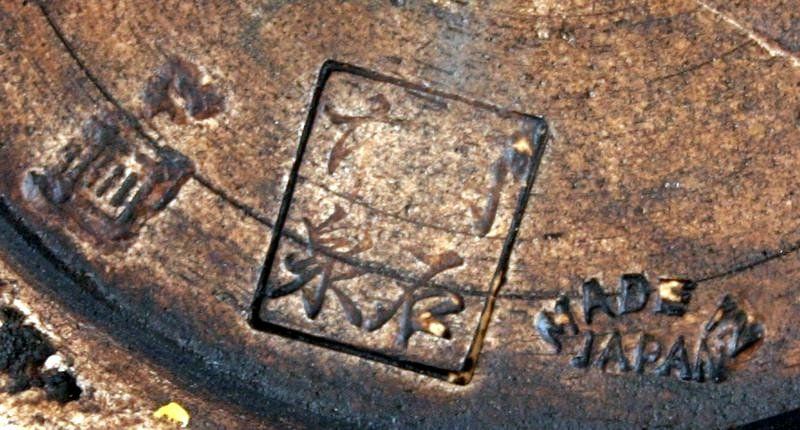 The pieces stamped “JAPAN” were produced sometime between 1890 and 1922 when the law was rewritten, and requiring “made in” to be added to the mark. 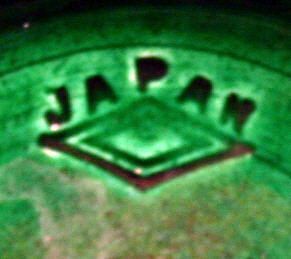 The impressed “MADE IN JAPAN” mark on Awaji pottery was used between 1922 and the kilns’ closings in 1939. 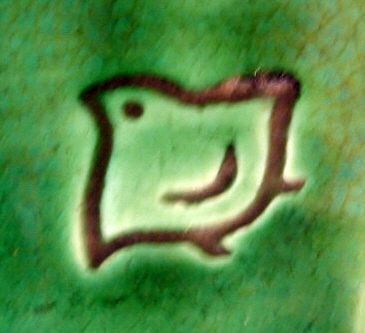 The Danto Company did reopen after the war as a commercial ceramic tile manufacturer, but never made art pottery again. Audsley, George, and James Bowes. Keramic Art of Japan. London: Henry Sotheran and Co., 1881. Ayers, John. The Bauer Collection of Japanese Ceramics. Boston: Routledge and Kegan Paul Ltd., 1982. Brinkley, Frank. 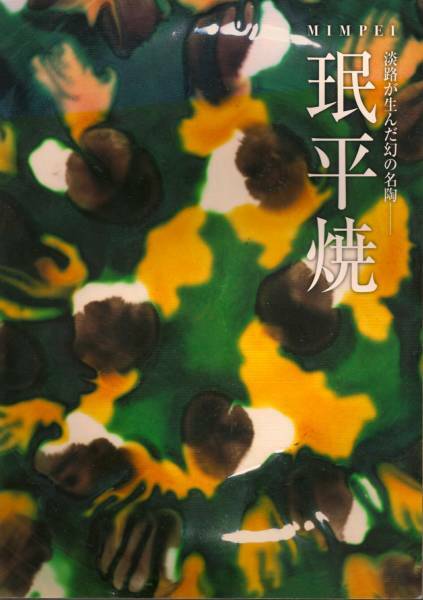 Japan, It's History, Art and Literature. Boston and Tokyo: J.B. Millet and Co., 1902. Franks, Augustus. Japanese Pottery. London: Wyman and Sons, 1906. Gorham, Hazel. Japanese and Oriental Ceramics. Rutland, VT & Tokyo: Charles E. Tuttle Co., 1971. Jenyus, Soame. Japanese Pottery. London: Haber and Faber, 1971. Morse, Edward. Catalogue of the Morse Collection of Japanese Pottery. Rutland, VT & Tokyo: Charles E. Tuttle Co., 1979. Cambridge; Riverside Press. 1901. Noguchi, Sanai. Minpeiyaki. Sumoto: Awajishima Museum, 1989. Stiff, Irene. Japanese Ceramics of the Last 100 Years. New York: Crown Publishers, Inc., 1971.